Mangaluru, Sep 4,2017: Columnist and Karavali Wikimedians secretary U.B. Pavanaja on Sunday said that there are plans to create offline Tulu Wikipedia as there are very few resources for students to learn Tulu, including textbooks. 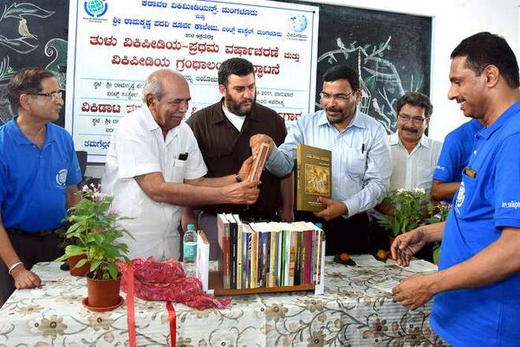 He was speaking at the first anniversary celebrations of Tulu Wikipedia and inauguration of Wikipedia Library at the Ramakrishna PU College in the city. Mr. Pavanaja said that the Karavali Wikimedians team is already on the job and institutions having computer facility can disseminate information to students through the new initiative. Mr. Pavanaja noted that Tulu neither has an encyclopaedia nor are there many articles on science. As such, Tulu language and culture could reach the new generation through the Wikipedia, he said. The Wikimedians team is actively working on Tulu, Kannada and Konkani languages. Wikipedia students organisations too are active in colleges, he noted. The former Folklore University Vice-Chancellor K. Chinnappa Gowda said that the work by the Wikimedians team to provide global knowledge in regional languages and hosting local information on the global platform is commendable. Wikimedia Foundation’s senior programme officer Asaf Bartov said that Tulu can follow the footsteps of Hebrew, which had almost become extinct except for being used in prayers. He said that Elezer Ben-Yehuda, who believed that the nation could be built only if its language is learnt, brought out the Hebrew magazine and dictionary after a relentless struggle. As a result, now a university is dedicated to Hebrew language. Similarly, Tulu, which already has a wide base, has the potential to grow and get a university for itself, Mr. Bartov said. Tulu Academy chairman A.C. Bhandary, Ramakrishna Educational Institutions convener B. Krishnaprasad Rai and others were present.